Kaplan offers a number of products to help parents and childcare specialists keep their changing areas clean and hygienic. Products include gloves, diaper refill storage units, changing paper, foot step diaper pails, deodorizers, and changing stations. 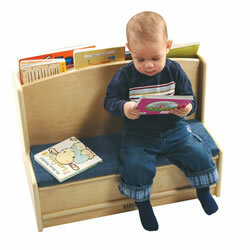 Kaplan also provides one-step trainer seats to aid children with their potty training. Twelve individual spaces with a dry-erase area for personalizing. 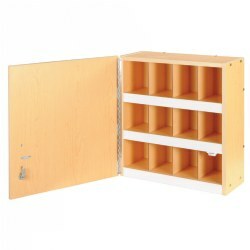 Keeps personal items secure and within reach. Includes two keys. 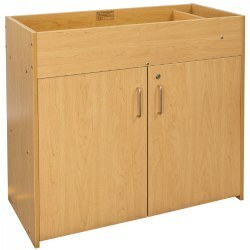 Each space measures 4 1/2"W x 6 1/8"H x 6 1/8"D. Cabinet measures 22"W x 22"H x 8 1/2"D.
This set includes 2 biodegradable refill packs for the Diaper Dekor™ Plus. Each refill holds about 580 newborn diapers. A convenient way to dispose of soiled diapers. 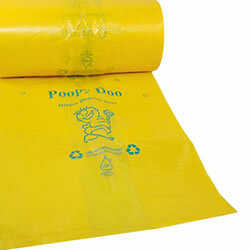 Bags are non-toxic, easy-to-tie, lock in wetness, stops odor, and have a light powder scent. Set of 200 refill bags. Semi-round step can has a flat back for easy placement against the wall and out of the way. 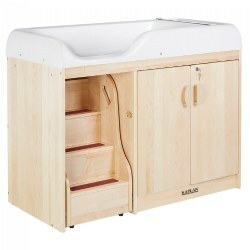 Its large capacity is ideal for busy areas. The liner rim lifts up for easy access to the liner, then closes to grip and keep it neatly out of sight. The strong steel pedal is built to last, and lid shox technology ensures a smooth, silent close every time. Uses 13 gallon standard tall kitchen bag, not included. 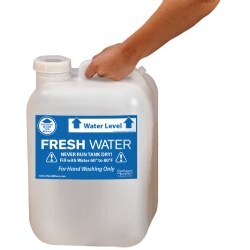 45 litre capacity (roughly 12 gallons). 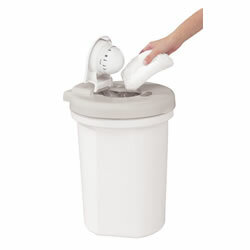 Measures 26.4"H x 15.7"W x 14.2"D.
Hands-free design provides a convenient, easy, and sanitary way to dispose of dirty diapers. The triple seal system prevents odors and germs. 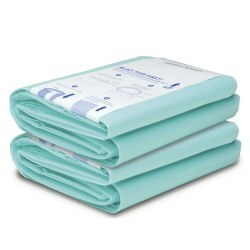 Each continuous refill bag holds about 580 diapers when used in its entirety. Bin stores approximately 60 diapers at once, depending on size of diaper. Includes one full length Diaper Dekor™ Plus refill. 21 1/2"H x 13"W x 9"D.
The back of the unit has two book shelves with plexiglass to allow books be been seen easily. Easy to clean seat cushion. Measures 26"W x 17 1/2"D with a 7" seat height. Fully assembled. 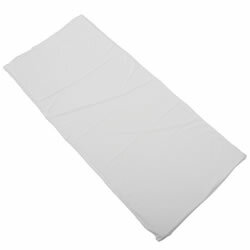 Roll style changing table paper lets you use as much or as little as you need. Keeps area clean and sanitary. 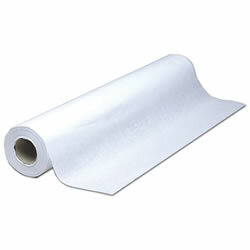 White paper measures 225' length. Choose between 14" width or extra-wide 18" width. Includes 12 rolls. This nontoxic deodorizer helps keep diaper pails smelling fresh with its baby powder scent for up to a month. Fits in the lid of Foot Step Diaper Pail (96433). Pack of 6. 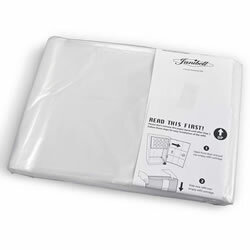 Unscented refill liners for 13 Gallon Diaper Pail (item #70351).These continuous bag liners come in an accordion-folded roll that allows you to create different sizes of bags at any given time -- and take out the trash in about 30% of the time that it would take with a traditional trash container. All you do is pull the bag downwards, cut the full bag with the built-in safety cutter, and then dispose. Tie a knot at the bottom of the refill and close. Pack of 10 liners. 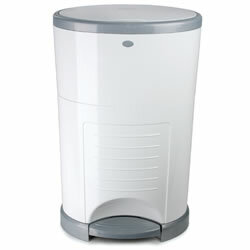 With this odor-free and hygienic diaper disposal system, you won't have to touch, smell, or see the contents. 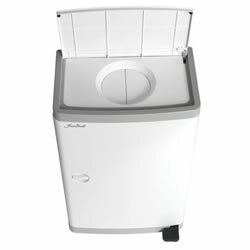 The top opens with a press of the pedal, then a leaver opens for the diaper to be deposited. Sealed lid, no unpleasant odors. 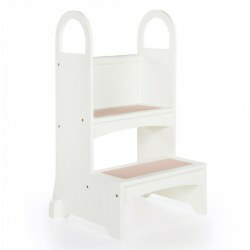 Holds up to 200 disposable infant diapers or 110 disposable toddler diapers per load. 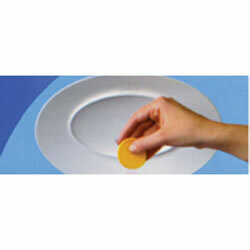 Measures 25"H x 15 3/4"W x 11 5/8"D.
Washing hands can be fun! Many states require hand washing as a regular part of a child's care. 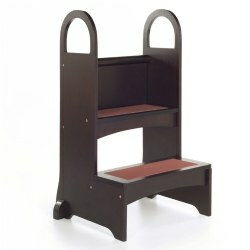 Easy to move, step up handles and step top covered with a non- slip pad. 32" H x 18" W x 16" D. Step height 6 1/2". Wt. 20 lbs. 2 years & up. Constructed of birch plywood, the High Rise Step-Up provides a safe and secure way for children to access sinks and counters. 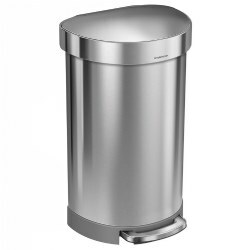 Features two wide steps with anti-skid surfaces, side stability brackets and oversized handle cutouts. 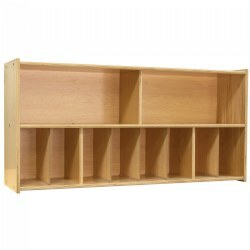 Measures 17"L x 21" W x 32" H. Adult assembly required. 2 years & up. Constructed of birch plywood, the High Rise Step-Up provides a safe and secure way for children to access sinks and counters. Features two wide steps with anti-skid surfaces, side stability brackets and oversized handle cutouts. 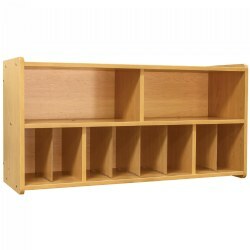 Measures 17"L x 21"W x 32"H. Adult assembly required. This water tank should be used for an extra or replacement fresh water tank with our Portable Sinks. EZFIll-n-Roll makes transferring water tanks easier. Place tank dolly near open door and slide the water tank in or out as needed. 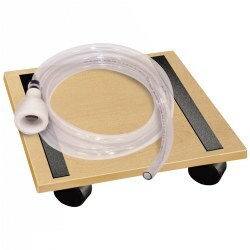 Roll the tank dolly over the water source and use the EZ-FILL TUBE to refill the tank. Kit includes 4 ft. of easily adaptable hose and tank dolly. Water tank sold separately. 3 - 4 years. 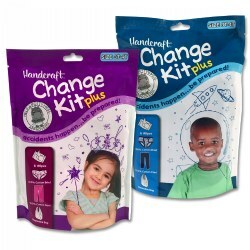 Accidents happen, be prepared with the Change Kit plus. Each pack includes 6 wipes, 100% cotton brief, disposable bag, and 100% cotton pant. Size 3T/4T. 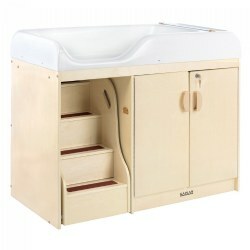 Eight diaper cubbies with a divided upper shelf. Mounting hardware not included. Mount per your local building codes. Fully assembled. Measures: 46 1/4"W x 23"H x 14 1/2"D.
Diapers can't be avoided, but odor can! Seal odors away beneath the unique child-resistant lid. Uses standard kitchen garbage bags, holds 18-25 diapers.